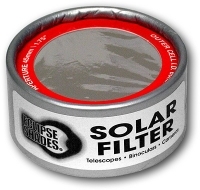 Solar Filters — Rainbow Symphony, Inc. 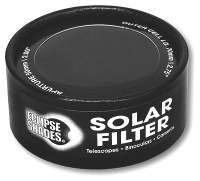 Solar Filters and Eclipse Filters are Absolutely safe for direct solar viewing. 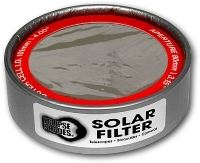 Eclipse Shades® Solar Filter – Our Black Polymer Solar Filters are a low cost alternative to our aluminum cell and glass filters. They have been designed with quality and cost in mind. 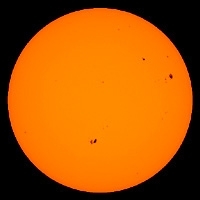 They can be used on telescopes, binoculars, cameras and finder scopes. This is the same high quality material you have come to know in our Eclipse Shades® Safe Solar Eclipse Glasses. Unlike other solar filters, our black polymer solar film will provide a more pleasing and natural Yellow-Orange image of the sun. This color also offers more contrast and clarity than other solar films. The advantages of this material is that it is stronger and more durable than other thin film solar filters. The actual filtering properties are protected within the substrate. Whether you’ve got a class full of kids learning about the solar system or you’re organizing an eclipse viewing party, Rainbow Symphony can help you prepare. 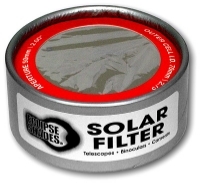 We provide a complete line of Eclipse Shades® Solar Filters that can be used with any sun viewing accessories including telescopes, binoculars, cameras, and finder scopes. All our solar filters are made using CE certified materials and meet ISO Standard 12312-2:2015 for your safety. Our varieties include Black Polymer Solar Filters in sizes 50mm, 60mm, 70mm, 76mm, and 101mm. Each filter style shows a slightly different view of the sun, but we make an effort to preserve the natural color and rays you see while still protecting your eyes. 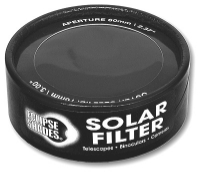 With our black polymer filters especially, you should expect a natural yellow-orange tint with more contrast and clarity than other solar films. Our filters are also stronger and more durable than other thin films, and the actual filtering properties are protected within the substrate. Measure the outside diameter (O.D.) of your telescope, camera, or binocular tubes and choose the closest inner diameter (I.D.) size larger than the outside diameter measurement of the lens holder. Do not choose a size that is the same as your O.D. since this will be too tight and won’t allow room for the felt lining. The I.D. of the cell slips over and around the O.D. of the telescope or binocular tubes. Use the included felt tape for a custom fit. 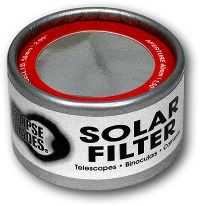 Please note that filters should always go over the end of the device closest to the the sun (the large end) — NEVER over the eyepiece that you look through! If you have any questions about wholesale orders of solar eclipse filters or fitting your filter, reach out to the team at Rainbow Symphony today! WANT TO SHOP WITH US? VISIT OUR ONLINE STORE! © 2015 Rainbow Symphony, Inc.